Confluence Psychology Alliance members pause for a photo with Associate Professor Robert McInerney, Ph.D.
Blankets, coats, hygiene products and more were collected and packaged for homeless individuals in the Pittsburgh area at Confluence Psychology Alliance's Blanket and Coat Drive Kick-Off Party Jan. 31 on campus. According to Robert McInerney, Ph.D., associate professor of psychology and Confluence's founder/advisor, the student group has been collecting and distributing blankets and coats for the city's homeless for 10 years. "Last year we had the idea to have a kick-off event for Confluence's annual blanket and coat drive. It was a success last year, with many new faces attending and bringing donations, so we decided to hold the event again this year," said Confluence Co-Chair Emily Jamison, a senior psychology major from State College, Pa., and a graduate of Tyrone Area High School. One of the main recipients of the donated items is Pittsburgh Mercy's Operation Safety Net, a nonprofit organization that provides hundreds of men and women living on the streets of Pittsburgh with access to health care and other services through drop-in centers, soup kitchens and medical vans. Point Park began a strong partnership with OSN after McInerney met the organization's founder and medical director, James S. Withers, M.D., several years ago at a campus lecture. In 2015, Withers was named a Top 10 CNN Hero. Over the years, Point Park students have worked closely with OSN. Last spring, undergraduate students helped the organization host an an art show on campus featuring artwork by homeless individuals while M.A. in clinical-community psychology students have worked with OSN as part of a practicum in advocate ethnography. "I love being in Confluence. It's really unlike any other extracurricular on campus. We have a decentralized government so that leaves a lot of room for everyone to get what they want out of the group whether that be hosting events of various interests, bringing in unique speakers or taking hikes together," Jamison said. She added: "My time with Confluence has really impacted me. We always have a good time and learn sometime new." 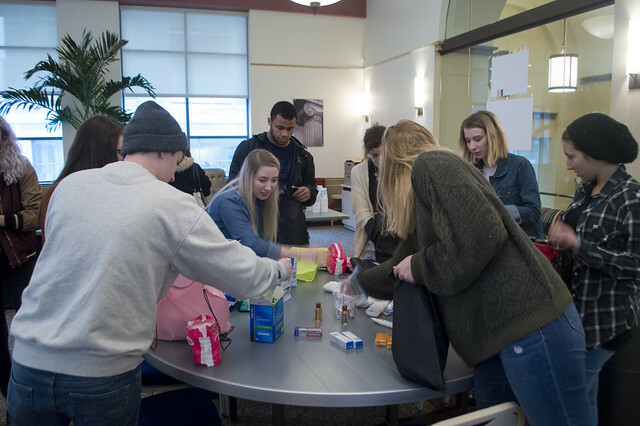 Confluence members have set up donation boxes in the lobbies of Academic Hall, Lawrence Hall, the Student Center and West Penn Hall. Donations will be collected through the end of the cold weather season. For more information about donating, contact rmcinerney@pointpark.edu.